Remember my Dulux paint project from way back when? 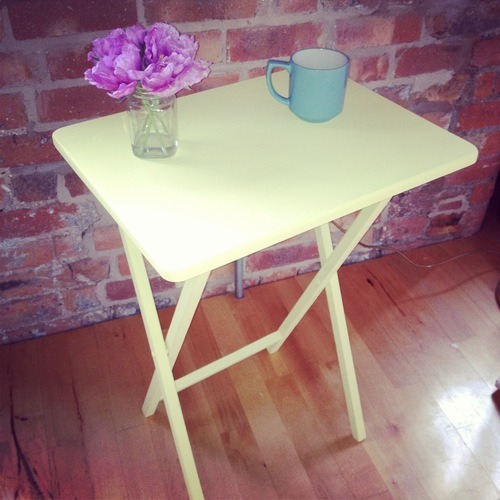 Well I decided to add even more colour to that lemon table! 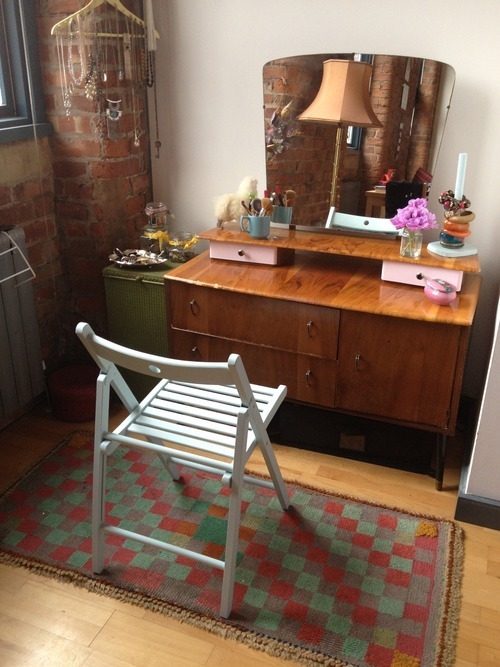 I inherited the vintage rug which you can just about see in the photos, it was handmade by my Great Grandma and I wanted the table to match (ish). I used mt Washi tape for the project. For those of you that haven’t used it before it is smooth, Japanese adhesive paper. The good thing about it is that you can easily remove and re-apply it without leaving any marks. You can do so much with it, anything from wall murals to nail art. Our house is pretty much covered in it right now, it is so addictive. I chose the salmon pink and stripe lilac tape and dove straight in without practicing. I ended up with this funky pattern which I actually really like! The table is now home to my record player and sits prettily on my Great Grandma’s handmade rug. If you want to get crafty and do your own DIY Washi tape project then you’re in luck, because I have a bundle to give away! mt has kindly provided the stash of five rolls pictured below for you to win. To enter and win the lot simply follow me on Twitter here and RT this tweet or follow me on Instagram here and like this post. If you’re already following me then just like or RT. Simple! The competition is open to UK residents only and the deadline is midnight on Sunday 19th May, 2015. One lucky winner will be chosen at random and announced on Monday. My lovely sister Rachael makes bath oils and she recently brought me a bottle from her latest batch. I lit my Heyland & Whittle candles and put on a face mask. It felt like I was floating on a dream cloud! It is so dreamy that I asked her for the recipe so that you guys can try it too. You will need a tiny funnel and the bottles that you choose need to be coloured glass to protect the oil from sun damage. Rachael gets her oils from Amazon and says that they are a little expensive but well worth it, and I agree! I have a few pieces of inexpensive furniture that have moved around with me from place to place since my university days. They looked ever so sad and dowdy in my new apartment so I decided to give them a colour-pop make-over. 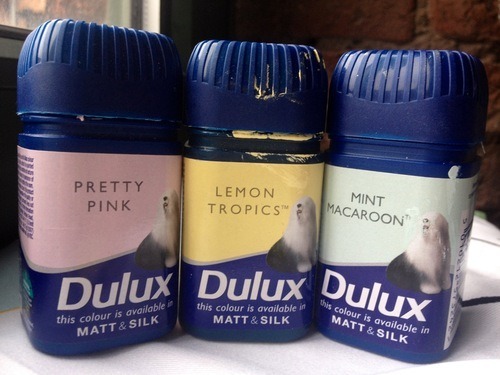 Dulux tester paint pots are brilliant for jazzing up furniture. You’d be surprised at how far the paint from those little pots can go. I chose Pretty Pink, Lemon Tropics and Mint Macaroon. Wash your brushes in hot soapy water as soon as possible so that they are nice and supple ready for the next project! Be warned it is addictive! I only intended on painting a chair and table but ended up getting a little carried away. The drawers of my dressing table are now Pretty Pink! 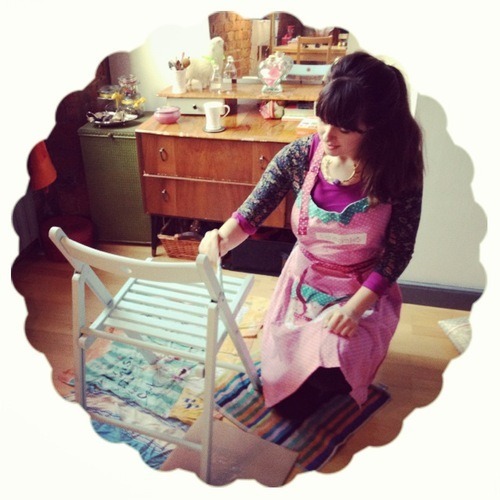 You can read about my jewellery organisers (as pictured above) in this post. It is a shame to keep beautiful necklaces hidden in a dark drawer, they end up getting tangled and damaged. I made this DIY jewellery hanger so that my necklaces could be forever on display and at my fingertips when I am getting ready in a rush. Tip – Pick a coat-hanger with a bar across the bottom as this will keep it balanced when you start to add your jewels. Hammer the tacks into the hanger symmetrically at equal distance across the top. You only need to tap them around a third of the way in. 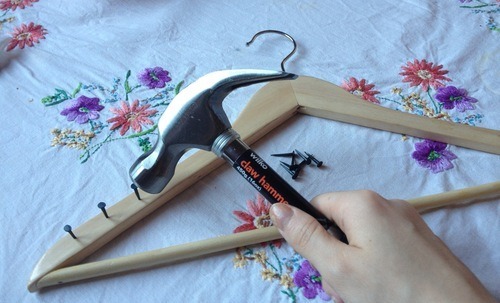 Hammer a nail into the wall and secure the hook of the hanger in place with an elastic band to stop it slipping. I used a feather hair-clip to hide the hook, you can see this in the photo below. 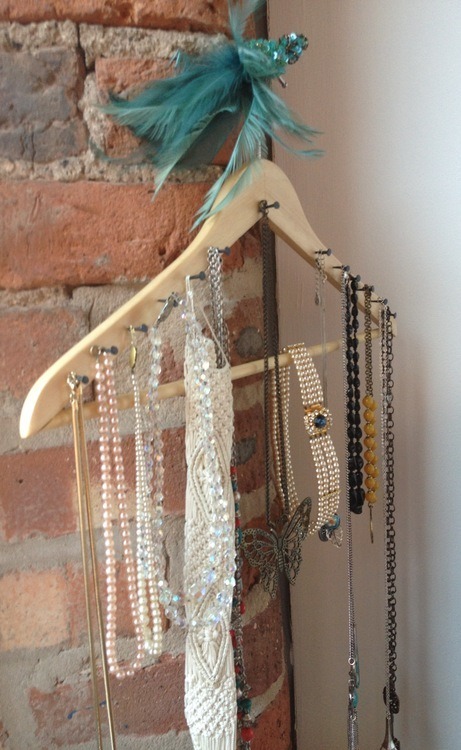 Now you are ready to start hanging your necklaces, this is a bit of a balancing act! Start at the edges and work your way in. 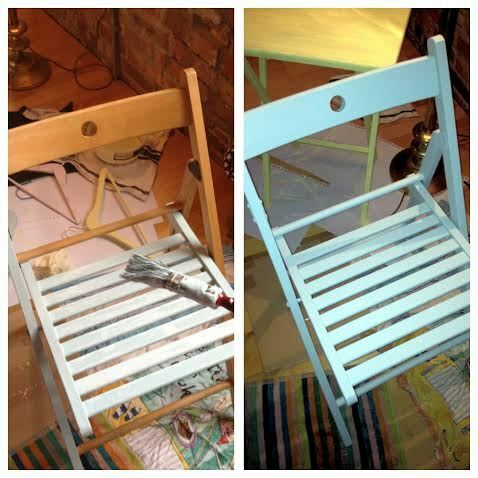 You could even jazz up your jewellery hanger by adding a splash of colour, read my Paint Project blog for tips. For more Operation Organisation projects check out the Jewels in Jam Jars post.